Cultured Granite | R &D Marble, Inc.
Cultured granite products are created by blending granite like particulate with resin. The result is a natural looking pattern creating the appearance of granite, which we call Cultured Granite. 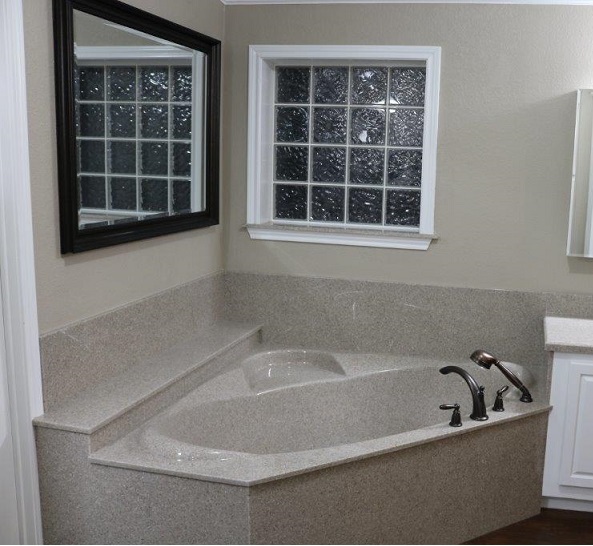 Cultured granite is cast in molds creating a variety of bathtubs, backsplashes, sinks, trim moldings, shower walls, countertops, and shower pans. Cultured granite products are available in a variety of residential applications including lavatories, vanities, shower surrounds, handicapped showers and shower bases, bathtubs and molding accents. Cultured granite successfully mimics the look of real stone with the added benefit of custom shaping, design, and a wide selection of color choices. Before being filled with the mixture, the molds are coated with a special gelcoat that bonds to the mixture, creating a very durable, and transparent surface. Cultured stone is made from approximately 82% natural marble or granite suspended in polymer resins. The mixture is poured into the mold and after the pieces have cured, they are removed from their molds and polished for a glossy finish or honed for a matte finish. Cultured stone products are easier than natural marble or granite to maintain. And because they are poured into molds, they have significantly more options than are available with natural stone. This product meets or exceeds the national standards to resist water, chemicals, heat, stains, bacteria, burns and every-day wear-and-tear.